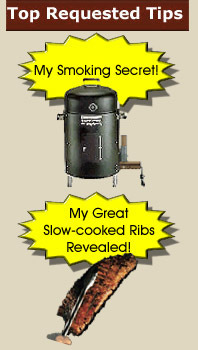 Tom's Personal Smoker and Grilling Barbeque Web Page Welcome to My Barbecue Smoker Page! Smoked Salmon a special barbecue recipe! Smoked salmon makes a great BBQ meal and leftovers can be given as gifts. I use a Brinkman or CharBroil electric smoker (I have both, but similar smokers will work just fine) with a SmokePistol attachment. I like the electric smoker for ease of use and the SmokePistol puts out plenty of smoke. This way I can spend my time drinking beer and having a good time instead of monitoring a fire and adding wood. 1 Salmon filet (about 2.5 lbs skin off) I prefer using the farm raised to wild salmon because the taste is not as strong and people who don’t like salmon will like this smoked salmon but the wild salmon is great for salmon lovers. ½ cup Heinz or Lee & Perrins (my favorite) Worcestershire sauce. Put 2 TBS Ketchup into a cup and mix a little Worcestershire into it well. Pour into a glass bowl. Add ½ cup Worcestershire and ½ cup Soy sauce. Add ½ teaspoon salt, ½ teaspoon pepper and ½ teaspoon Montreal Steak seasoning. Stir well. Cut salmon (across filet) into 3” to 4” wide strips. Place salmon into the above marinade and refrigerate for about 1 hour. Take the grills from your smoker and rub butter on both sides of each grill (this makes cleanup easy and helps keep salmon from breaking and sticking). Place Salmon on the grills, sprinkle with Montreal Steak seasoning and let them sit for about 15 min outside the smoker while your smoker heats up. (you want the salmon to dry out a little) Fire up your SmokePistol or other smoke source in your heated smoker and make sure your water pan is full. (you need moist heat for smoking fish and seafood) I use maple wood because the flavor is great with salmon but hickory and others will work fine. Place the grills loaded with salmon into the smoker and smoke for about 3 – 4 hours with the temperature about 215 - 225 degrees F.
When the smoked salmon is done I take several pieces and vacuum seal them individually with one of those food sealers. I do it while they are hot and then immediately refrigerate. This will increase there longevity if you want to give them to friends.